Tara is known in Tibet as 'She Who Liberates'-a compassionate bodhisattva who delivers us from fear and protects us from harm. Now Tibetan spiritual leaders and devotional artists come together in celebration of this beloved 'Mother of all Buddhas'-featuring tracks from His Holiness the Dalai Lama, Her Eminence Jamyang Sakya, Dechen Shak-Dagsay, Nawang Khechog, Deva Premal, and many more. 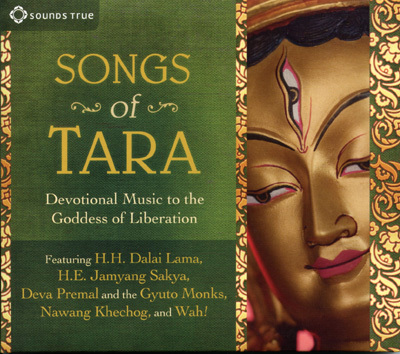 Songs of Tara is a meditative collection of mantras, chants, and praises to help us connect to the energy of this swift and heroic goddess. Includes modern and traditional devotions to Green Tara, who leaps to our aid when we are in need, and White Tara, who offers longevity so we may have more time to serve others in this world, and the complete Tibetan Homage to the 21 Taras.